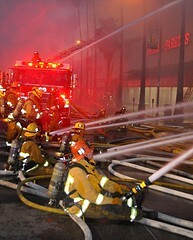 VAN NUYS - Over 125 Los Angeles Firefighters extinguished an enormous fire in a 150' x 100' one-story commercial building in just under two hours, where two Los Angeles Firefighters were injured. Just after 5:00 pm on Wednesday February 15th 2012, firefighters arrived to find fire blowing out one unit of a strip mall, located at 6600 North Van Nuys Boulevard. Waves of additional firefighters were requested. Extensive amounts of smoke could be seen for miles as it lingered low to the ground due to a heavy marine layer and slowly pushed south by light winds. The structure located was of older construction with a conventional roof, parapet, and a common attic space. The open area under the roof allowed fire to rapidly spread across the tops of three business before hitting large division walls, halting the advancement of the flames. Shortly into the extended battle, firefighters switched into a defensive attack. Truck Companies quickly finished cutting holes on the roof with chainsaws. Fire blew through the roof forcing firefighters to rapidly exit. Firefighters on the ground used large 2 1/2" hose-lines along with ladder pipe operations, where copious amounts of water was sprayed from the end of extended aerial ladder trucks, capable of 2000 gallons per minute, into the structure. Three separate stores were damaged, doing business as: First Bargin Center, Birrieria Luita, and El Pantalon. The blaze was fully extinguished in one hour and 53 minutes before any adjacent buildings were damaged. Two firefighters received minor injuries and were transported to local hospitals in fair condition. The dollar loss is still being tabulated and the cause is under active investigation.